shine brite zamorano: hanging out with louise. This week I got thisclose to completely installing the sculpture projects the 5th graders completed in small groups last year. It was my original intention to go in over summer break and do it. Alas, real life intervened. The project was inspired by the work of sculptor Louise Nevelson. However, if I had accomplished that goal over the summer, I would not have had the pleasure of working on it with small groups of exceptional students from this year's 5th grade classes. Watching their expressions as they hold a drill for the first time, as well as their reactions to hearing the sound of the drill, have been priceless. It's so new for most of them. They have painted and drawn, worked with clay, made prints, but for many, this is their first experience with power tools. The students have been enthusiastic, a bit nervous, and extremely helpful. They have been pre-drilling holes in the plywood pieces, assisting in placement on the wall, and drilling the screws into the wall. I get to do the drilling into the concrete wall. I am out of shape. There are 4 more squares to go. I am hoping to be done by Monday afternoon. The original installation format has been modified to deter vandalism. As the change in composition occurred it grew on my more and more. Instead of being a stationary, grounded sculptural form, the collection of squares brings forth an abstract vision of flight. After the installation is complete it will be spray sealed to further protect it from the elements. It's finished. The final four squares were installed this morning. Now I can put the drill away and let my out of shape back muscles recuperate! Thanks to all the 5th graders last year for making the sculptural squares. Thanks to all the 5th graders this year that helped with the install. Thanks to my father in-law for helping me cut all the panels. Thanks to the 5th grade teachers for their cooperation and support. An email from Karen Childress-Evans, director of VAPA. This is amazing. Please tell the kids and all the staff who worked on this Congratulations on a work well done! 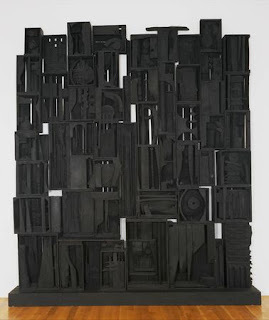 I love Louise Nevelson's work. I actually saw an exhibition in Philadelphia a couple of years ago imitating her style. Each piece had a letter of the alphabet in a collage of objects (obscure as well as obvious) that started with that letter. Each work was painted stark white. The show was amazing. Your kids are so fortunate to be at Zamorano. Wow!This is beautiful. I am amazed at the idea of putting it outside. I think you should photograph it in all seasons! I'm being selfish because I want to see more pics. . . love love love it!